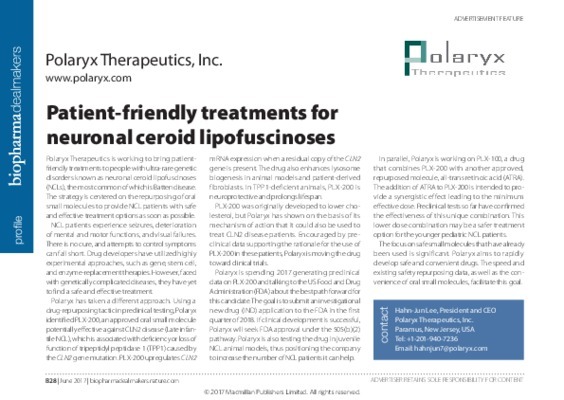 Polaryx Therapeutics, Inc is a biotech company devoted to the development of therapeutic interventions for Neuronal Ceroid Lipofuscinosis (NCL), a group of rare genetic lysosomal storage disorders in children. NCL is also known as Batten disease. Among the subtypes of NCL, we are focusing on the development of patient-friendly oral medications for Late Infantile Neuronal Ceroid Lipofuscinosis (LINCL or CLN2). Children with CLN2 have progressive deterioration of their mental and motor functions, visual failure, and seizures leading to premature death. The disease has no cure, and thus has a high unmet medical need.